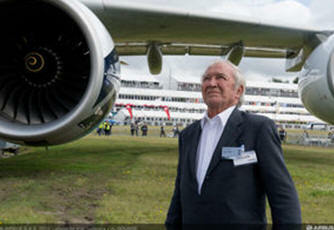 July 11, 2012 - Bernard Ziegler, one of modern day commercial aviation’s most brilliant engineers and test pilots received the Flightglobal Lifetime Achievement Award on Tuesday at a ceremony at the 2012 International Farnborough Airshow. The award was handed over by Murdo Morrison, Editor of Flight International in recognition of his outstanding contribution to the aerospace industry. This prestigious award celebrates in particular the key contribution Bernard Ziegler, son of the former Airbus CEO, Henri Ziegler made to the introduction of Fly-by-Wire (FBW) for the first time ever on a commercial aircraft with the A320 in 1988. All current generation Airbus aircraft are Fly By Wire and it has become the industry standard. Bernard Ziegler was the most influential figure in developing the cockpit design and fly-by-wire control system for the Airbus airliners. He proposed that numerous technological innovations be applied to Airbus aircraft; for example, using composites, twin-engine configuration for the A300, fly-by-wire and many others. He was the guiding force in the creation of the flight envelope protection, incorporated in the Airbus flight-control software. This innovation allows the pilot to apply the maximum control forces considered necessary, while preventing inadvertent inputs that could place the aircraft outside the safety margin. This feature is considered by many to be highly beneficial in avoiding unusual attitudes in flight and in safely maximizing the effectiveness of evasive maneuvers in response to GPWS warnings. FBW has significantly reduced the overall accident rate as demonstrated in 24 years of experience with more than 150 million flight hours and more than 65 million flights by close to 7000 a/c in service all over the world. Fly-by-Wire means that there is an interface replacing the mechanical systems in an aircraft. It transfers the pilot’s commands to the aircraft via electrical signals. Years of reliable service around the world have validated FBW’s significant benefits through commonality, improved flight safety, reduced pilot workload, a reduction of mechanical parts, and real-time monitoring of all aircraft systems. Following his career at the French Flight Test Centre, Bernard Ziegler joined Aerospatiale in 1970 with the creation of the Airbus Flight Test Department, of which he became Director. On 28th October 1972, Bernard Ziegler flew as a test pilot on the first flights of the A310, A320 and A340-200. In June 1993, he participated in the longest flight ever undertaken by a civil aircraft, when an A340-200, dubbed the "World Ranger", flew around the world with just one stop in just over 48 hours. The crowning success of his career was his appointment as Airbus Senior Vice President Engineering, a position which he occupied until 1997.